Set yourself apart with an attention-grabbing resume. The job market is more saturated than ever. How can you help your application get noticed? Job hunting is stressful. 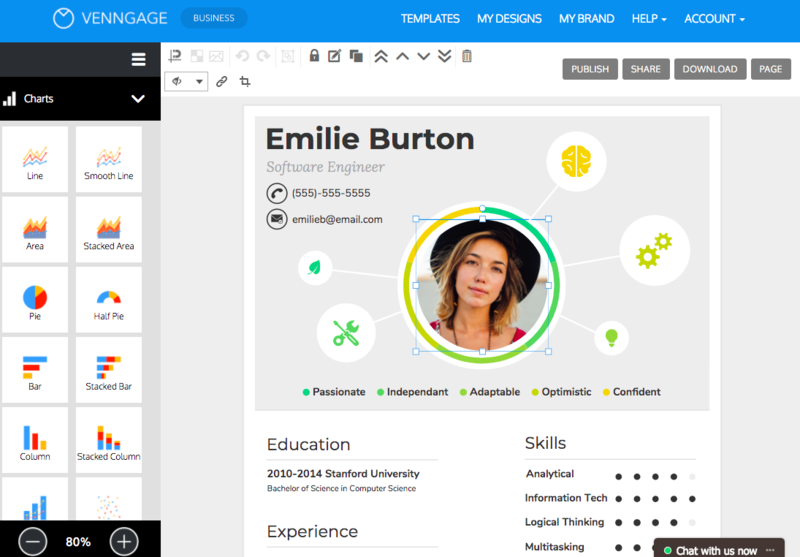 Venngage, the online resume maker makes it a little bit easier. 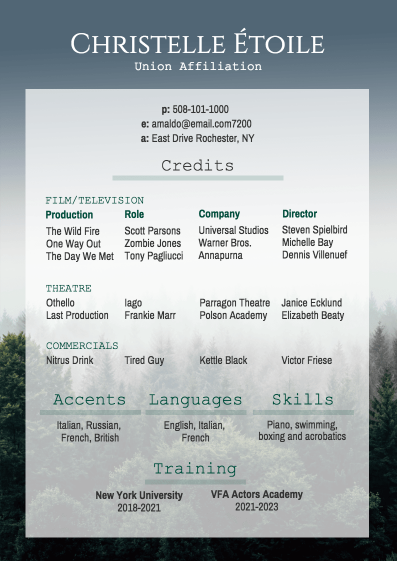 Use one of our customizable resume templates to create a resume that will grab the attention of employers. Sign up for Venngage - it's free. Pick a resume template that speaks to you. Add your experience, interests, and skills. 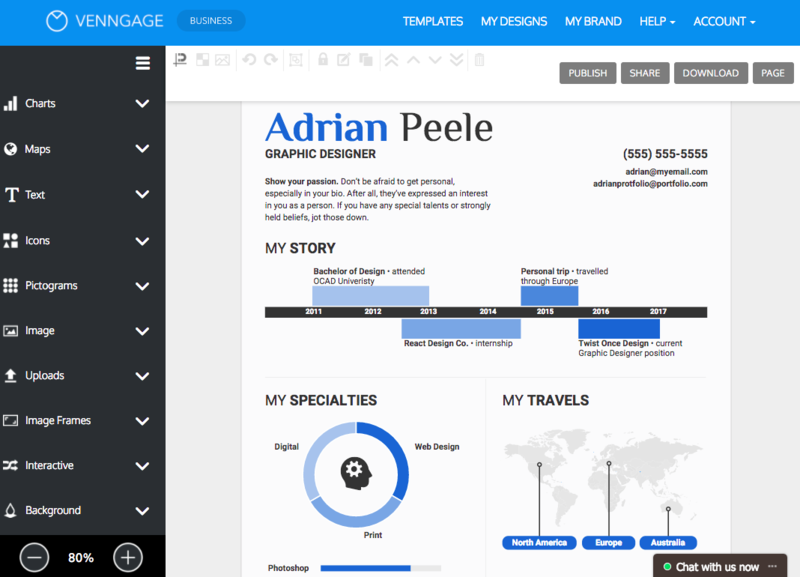 Customize your resume fonts, colors, images and icons. Download your resume and get your name out there! A lot of companies are placing more importance in building a great company culture. Show employers why you're a fit for their company with an original resume design. 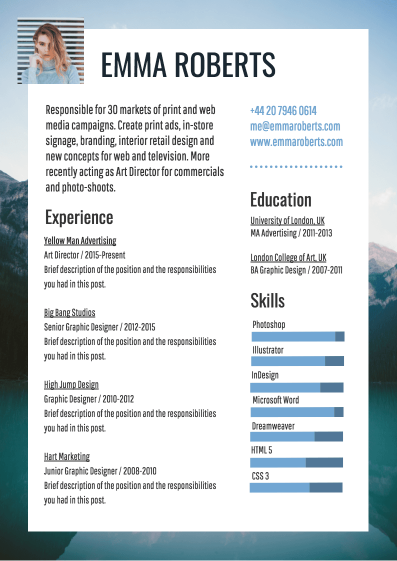 A good visual resume finds a balance between personal expression and industry standards. Find a resume that will appeal to companies in your industry. Often, hiring managers have to look at hundreds of applications. Presenting your information visually will help you stand out from the crowd. 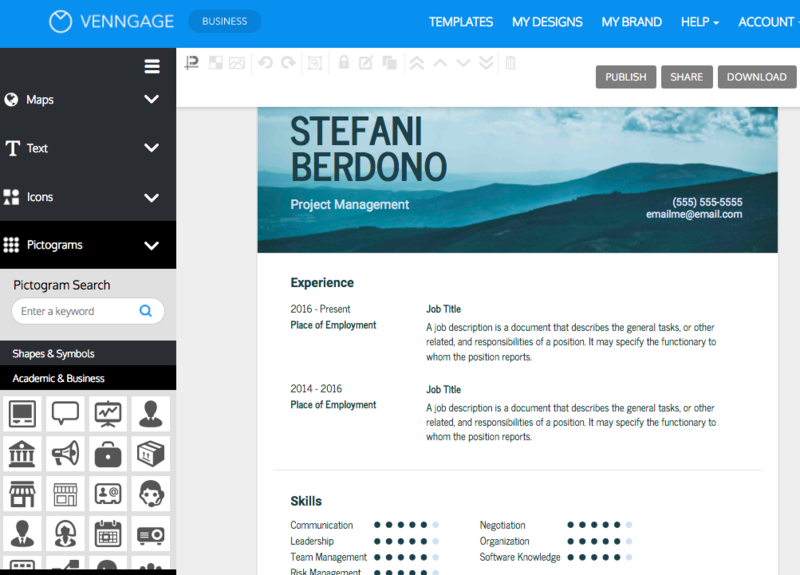 Use icons and images to make your resume more visually engaging. Browse Venngage's library of over 40,000 icons! You don't have to be a graphic designer to create a beautiful infographic. 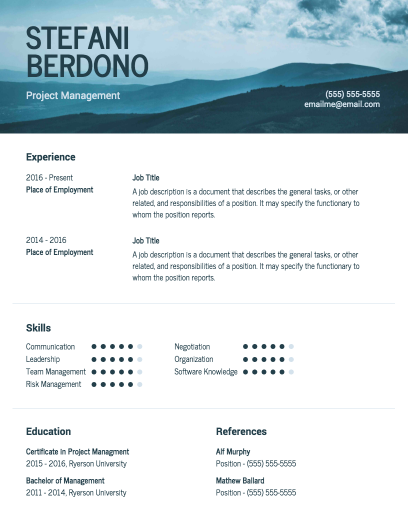 Just start with one of our fully customizable resume template. Venngage offers a wide variety of different resume designs, so you can find one that fits you. Our drag-and-drop resume maker is beginner-friendly, and will help people of all design levels create awesome resumes in a pinch. Are you not sure if your resume will appeal to a particular workplace? Create multiple resume designs to give yourself a greater chance of succeeding. 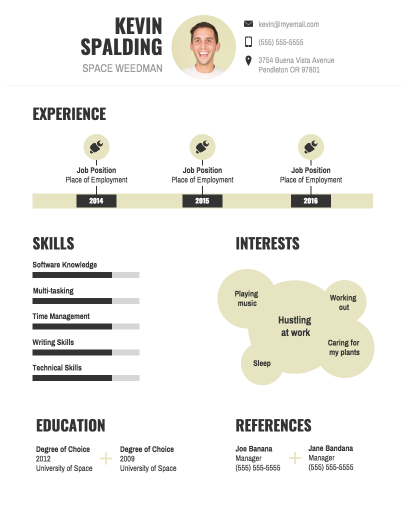 Designing your own resume is stress-free when you start with a pre-made template. There are a lot of job hunter you have to compete with. Often, hiring managers need to look through hundreds of applications. That's enough to make anyone go cross-eyed. Now imagine what they will think when they come across your creative resume. Give your experience a visual spin by using icons, pictograms, and charts to show achievements, milestones and skill levels. 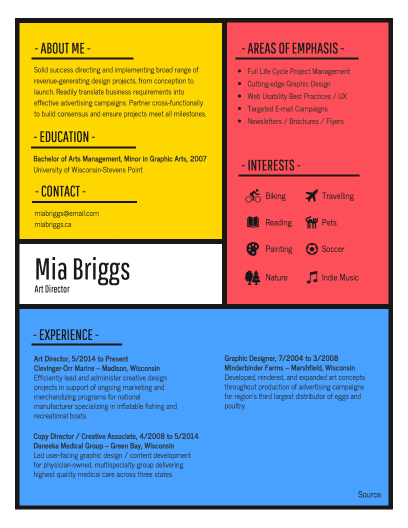 Add splashes of color to your resume design to reflect your personality. Upload your own image to show first-hand examples of your qualifications. Do you want to highlight your professional growth? Do you want to emphasize your personality traits that make you a good fit for a particular company? Or do you want to show where your experience has taken you around the world? 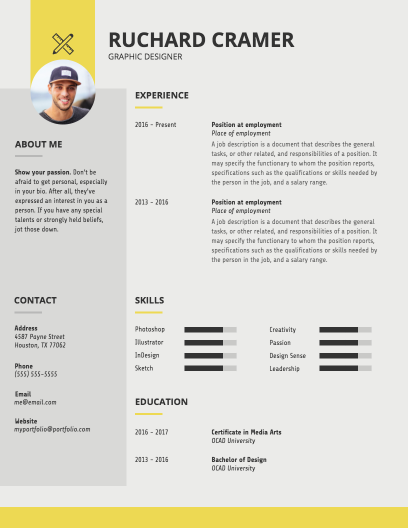 Venngage offers a library of resume templates with a wide variety of different layouts. 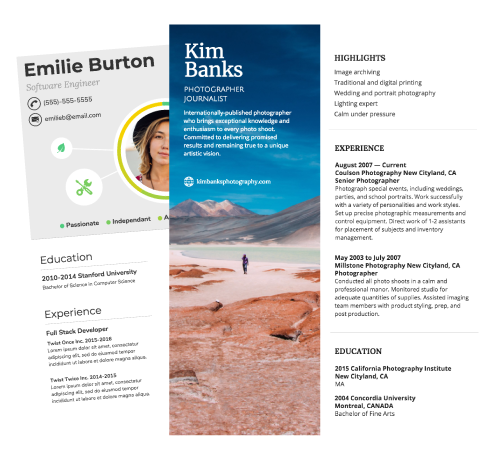 From timeline-centric resumes to traditional resumes with a creative twist, you can create a resume that fits your individual story. Any of our templates can be customized as much as you want using the free form canvas. Don't be afraid to dive into designing your own resume! Icons are perfect for emphasizing points and illustrating ideas. They also don't take up much real estate on your resume design. Venngage boasts a library of over 40,000 icons for virtually any topic. Add icons to your resume to indicate section heads, to make information easier to scan, and to make your design more pleasing to look at. 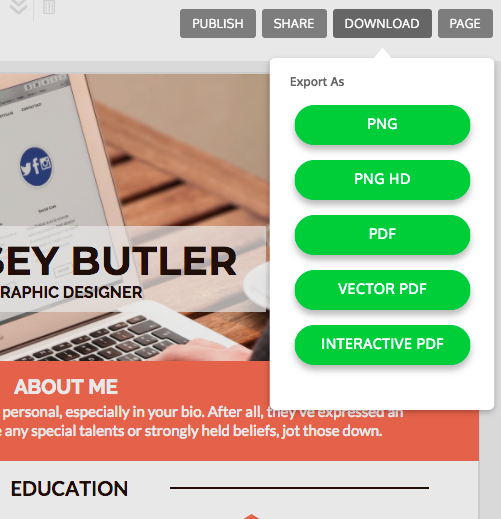 Our stock image library also makes it easy for you to add your own creative resume header. But if you have a specific image that you want to do, you can simply upload your image and drag it into your template. Venngage makes it easy to personalize your design to fit your personal taste. 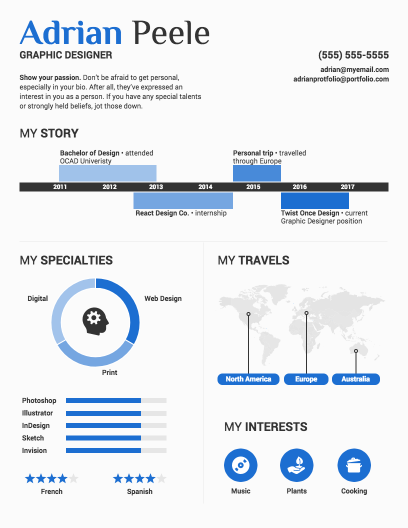 A visual resume is perfect for bringing to an interview or posting on your personal site. With Venngage, you can download your resume in high quality PNG or PDF format. If you want to share your resume directly to social media, you can do that in just a couple of clicks directly from the resume maker. 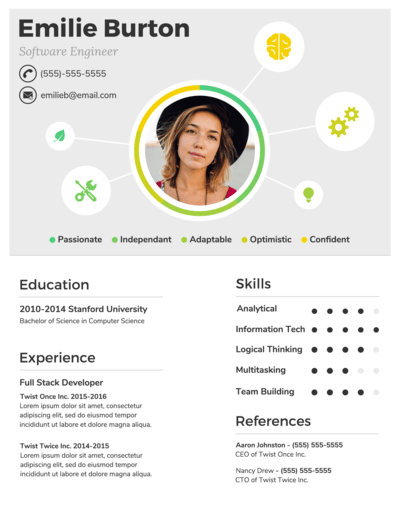 Arrive at your job interviews ready to impress with an awesome resume. How do I sign up for Venngage? To start creating on Venngage all you have to do is follow this link https://infograph.venngage.com/signup and sign up with your email, Facebook or Gmail account. Can I edit my resume after it's saved? Yes! You can go back and edit your resume at any time. 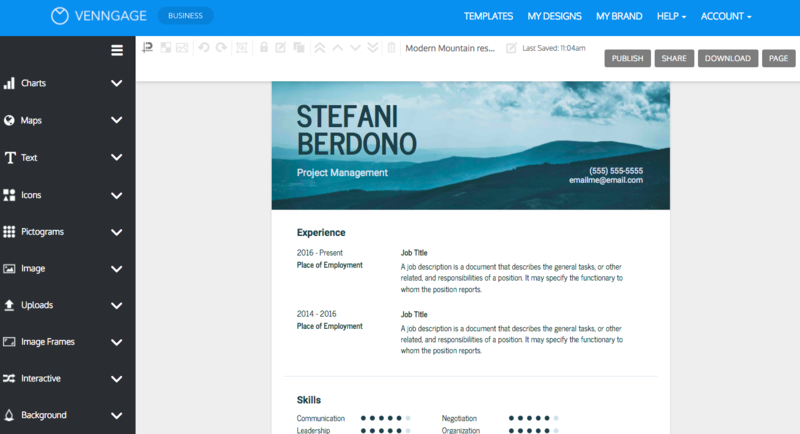 Simply open the draft in your My Designs library and continue editing your resume. Can I share or print out my resume? Yes! 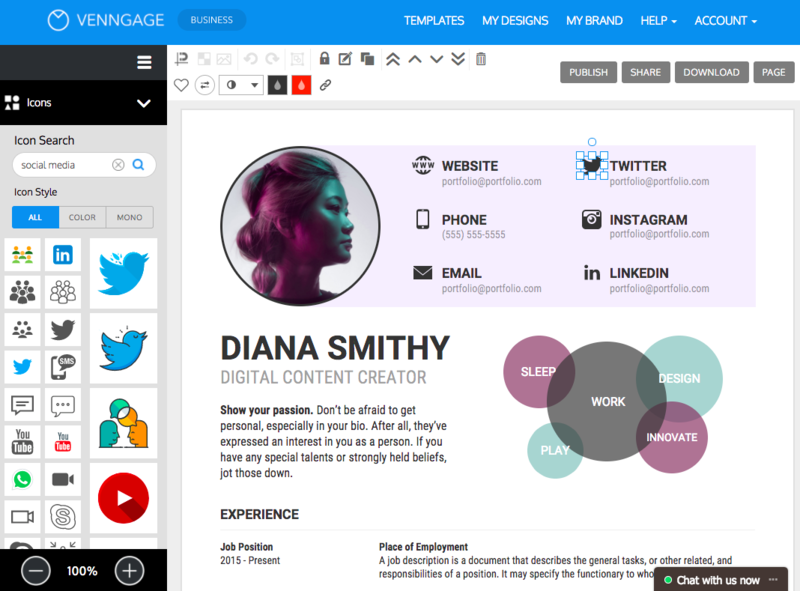 Using a free account, you can share your resume online or on social media directly from Venngage with a few clicks. To download your resume as PNG or PDF, upgrade to our Premium or Business plan. Find more resume templates in our templates library!